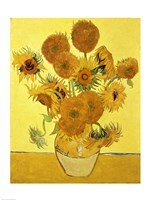 This is one of many versions Van Gogh made of the famous sunflowers whilst in the asylum of St Remy. He referred to them as being "all absolutely equal and identical." In reproducing his own work in this way, Van Gogh was openly flouting the accepted notion of the supremacy of the "one-off" and "never-to-be-repeated" original. In fact, Van Gogh often repainted earlier works in order that he might retain a copy of the canvases he gave away to friends. 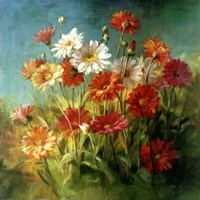 'Vase with Twelve Sunflowers' is another example of the "light on light" technique that he so magically employed. Various tints of the same color are used together, layer upon layer, to stunning effect. The vase, background wall and table surfaces are essentially smooth and almost even in tone, in distinct contrast with the sunflowers themselves. The vibrant heads are bought into sharp relief by the longer brushstrokes of the leaves and stems. Described by critics as "an ode to Provence" and "the best still lifes in the history of art", these sunflowers reminded Van Gogh of the happy days he spent in the Yellow House at Arles, full of anticipation for the coming visit of his friend, Gauguin. Confirmed in an asylum for the mentally disturbed, memories of those joyful days in Arles were surely what helped to prevent the gof of depression enveloping him completely.